These sopapilla cheesecake bars have a thick layer of creamy cheesecake between 2 sheets of flaky pastry. 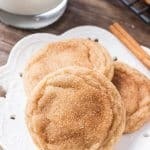 Then they’re topped with buttery cinnamon sugar. This version of sopapilla is made with only 8 ingredients – so it’s quick, easy & oh so delicious. 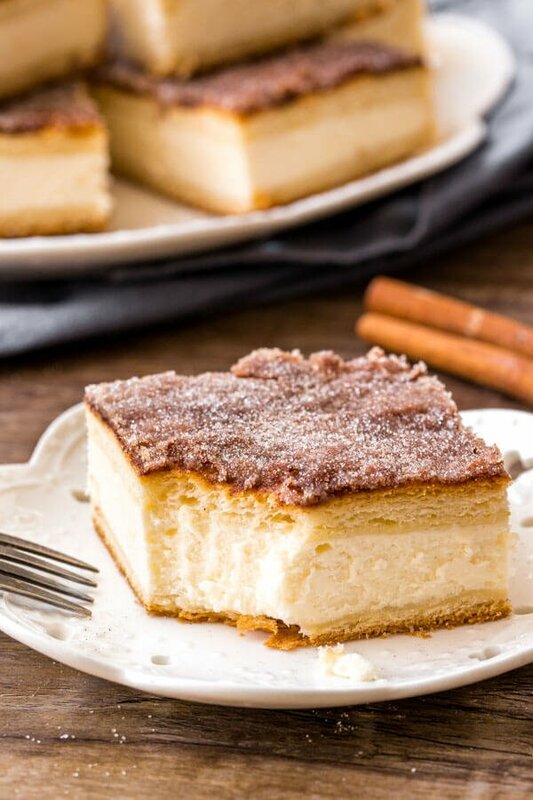 Sopapilla cheesecake bars are a decadent cheesecake recipe that’s perfect for cinnamon lovers. It also requires very little actually baking/ kitchen skills – so it’s also very easy to make. Two layers of flaky pastry surround the creamiest cheesecake layer. Then a sprinkle of cinnamon sugar goes on top. 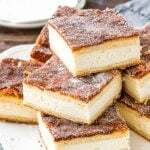 You can thick of sopapilla cheesecake bars almost like the baby of a cinnamon sugar doughnut and New York cheesecake. The sopapillas that most North Americans know and love are a traditional Hispanic dessert that’s thought to have originated in Albuquerque, New Mexico. It’s a deep-fried pastry that’s often dusted with powdered sugar, sprinkled with cinnamon sugar or drizzled with honey. They can have a variety of different fillings, including both sweet and savory. When the pastry is fried it creates little air pockets and becomes pillowy soft. Unroll one tube of crescent rolls. Flatten them out onto the bottom of a greased 9×13 inch pan, and pinch the seams together. Make the cheesecake layer. Beat the cream cheese and sugar together until smooth. Then mix in the cornstarch and a little vanilla extract. Last but not least – mix in the egg. Easy peasy. Pour the cheesecake over the crescent roll base and spread smooth. Add the second layer of crescent rolls. Unroll the second tube of crescent rolls onto a piece of parchment paper (or lightly greased work surface), pinch the seams closed and roll it out slightly with a greased rolling pin. Carefully transfer it on top of the cheesecake layer. Top with cinnamon sugar. Brush 1/4 cup melted butter on top, then sprinkle cinnamon sugar on top. 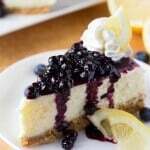 Cool the cheesecake fully to room temperature, and then place in the fridge for at least 3 hours before serving. For an extra decadent treat, you could top them with a drizzle of honey or a drizzle of cream cheese icing. Should sopapilla cheesecake be refrigerated? Yes – always keep cheesecake refrigerated. 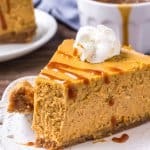 Take the cheesecake out of the fridge 30 minutes before serving. 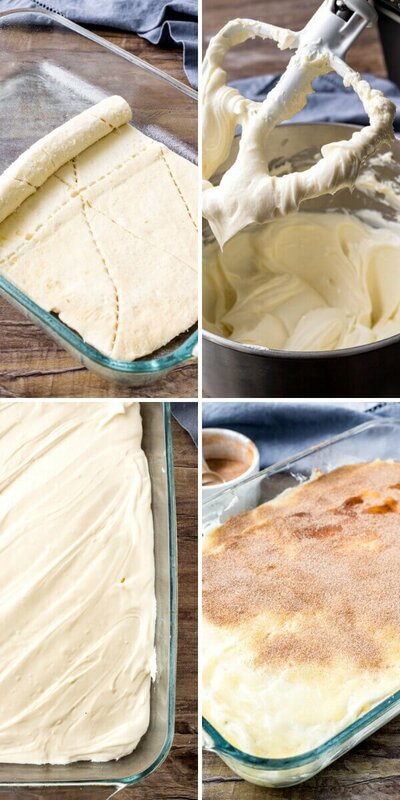 Can I make these sopapilla cheesecake bars without crescent rolls? Yup! Feel free to use puffed pastry instead. I only have lite cream cheese – will that work? I do not recommend using lite or spreadable cream cheese when making cheesecake because it isn’t thick enough. 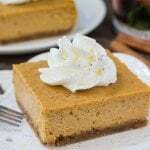 Can I freeze this cheesecake recipe? Absolutely. Cheesecake freezes very well. Thaw in the fridge overnight before enjoying. 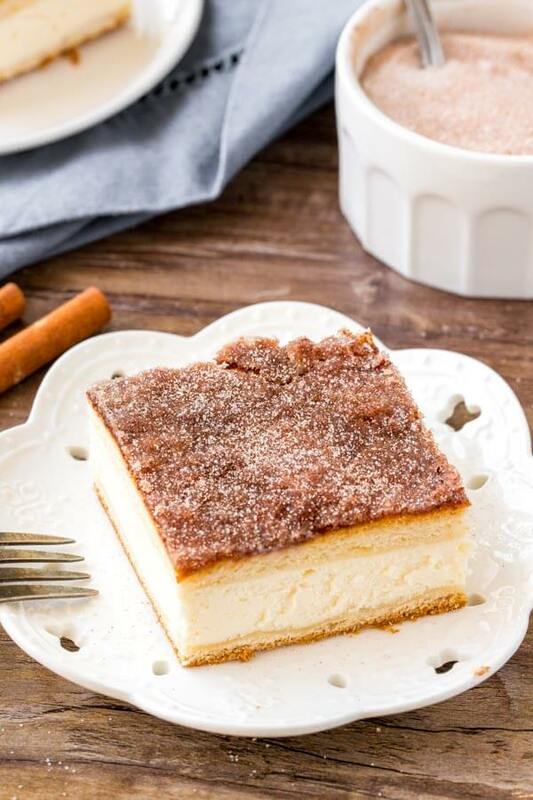 With flaky, buttery pastry, extra creamy cheesecake, and cinnamon sugar – what’s not to love about sopapilla cheesecake bars? So easy, so delicious, and the perfect cheesecake recipe to add to your repertoire. 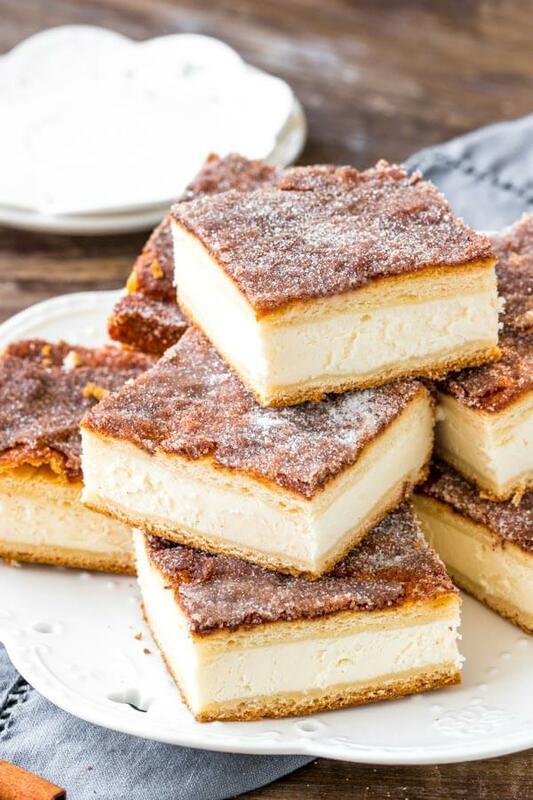 These sopapilla cheesecake bars have a thick layer of creamy cheesecake between 2 sheets of flaky pastry. Then they're topped with buttery cinnamon sugar. This version of sopapilla is made with only 8 ingredients - so it's quick, easy & oh so delicious. Preheat the oven to 350F degrees. Lightly grease a 9x13 inch glass or ceramic pan with non-stick cooking spray. Unroll one can of crescent rolls onto the bottom of the pan. Pinch the seams together and press the rolls out to cover the bottom of the pan. In a large bowl beat the cream cheese until soft. Beat in 1 cup white sugar and cornstarch. Mix in the vanilla extract & egg. Pour the batter over top of the crescent rolls, smoothing it down. On a piece of parchment paper (or lightly greased work surface), unroll the second package of crescent rolls. Pinch the seams together and gently roll out the dough to be about 1/2 inch longer & wider. Carefully place the sheet of crescent roll dough on top of the cheesecake layer. Spread the melted butter over top. In a small bowl whisk together the remaining 1/4 cup white sugar and cinnamon. Sprinkle over top of the bars. Bake in the preheated oven for 35 - 40 minutes, or until golden brown. Remove from the oven and cool to room temperature. Then chill in the fridge for 3 hours, or overnight before serving. *Use full-fat, brick style cream cheese. **Cornstarch helps the cheesecake layer to be extra thick. If you don't have any on hand, the recipe will still turn out delicious. Store in an airtight container in the fridge for up to 4 days. Bars can be frozen in an airtight container then thawed in the fridge overnight.